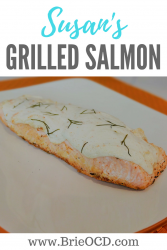 This grilled salmon recipe is super easy to make, healthy and has little-to-no cleanup! Now that’s a feat! I got this recipe from my Aunt Sue when she came to SD to visit and have been making it ever since! Salmon has many health benefits, including reducing the risk of heart disease. It is protein packed and has all the Omega-3 fatty acids you need! Because of the higher fat content (do not worry, they are healthy fats!) it is easier to cook because it doesn’t dry out as fast as other fish do when cooking. 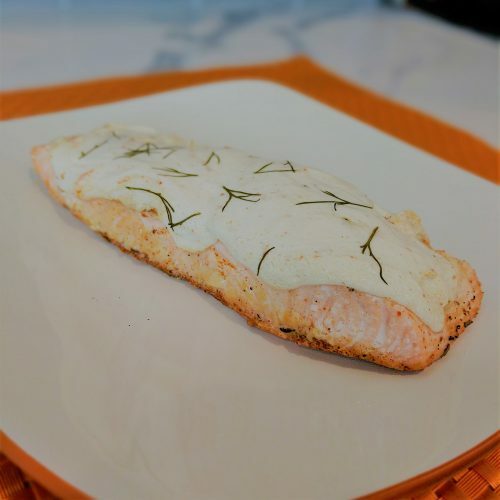 This salmon recipe has approximately 395 calories per 6oz serving and is packed with 40g of protein, 22g of fat (healthy fat!) and 2.6g of carbs. 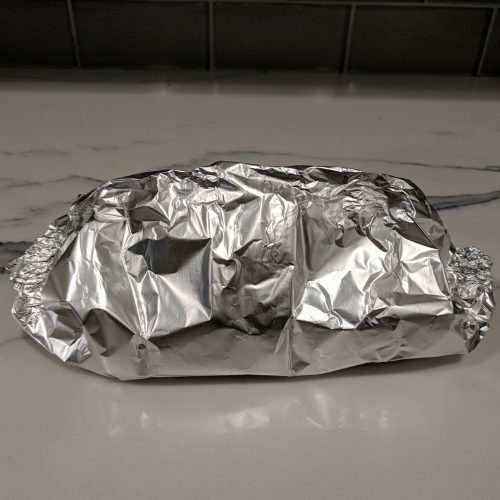 I make a foil pack and cook it on the grill (see recipe below for step by step instructions). I do not suggest cooking it in the oven as the yogurt gets a little funky (in my opinion). I try to switch up the sides from time to time and serve the salmon with tomato/cucumber salad, quinoa, cauliflower rice, and cauliflower hash to name a few! 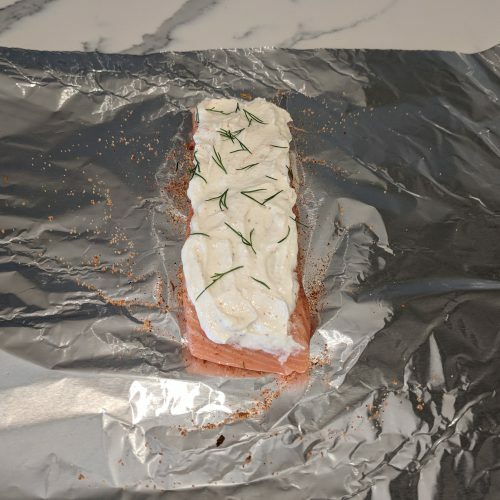 (click on the sides above to get the recipe) I top it with fresh dill to give it a herbaceous flavor. I give you measurements below for the seasoning but really I just eyeball it and lightly season the salmon fillet on each side. If you are using the creole as I suggest below, do not add salt! It will be way too salty! I buy my greek yogurt and salmon at Costco (surprise!). 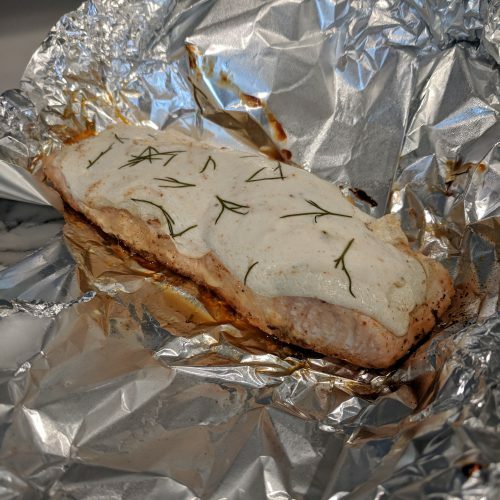 My husband portions the salmon out and puts the fillets into sandwich bags. I throw the portioned bags into the freezer and take them out when I am ready to cook them! That way I always have a quick and easy option at the ready! preheat grill to 375-400 degrees. 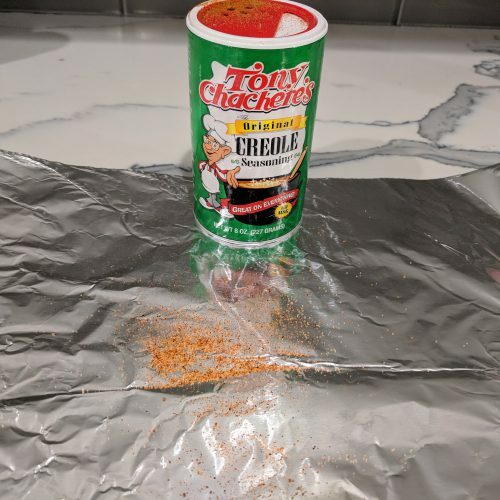 lay a large piece of tin foil on the counter top and sprinkle a little creole seasoning on it so that the fish doesn't stick when grilling. 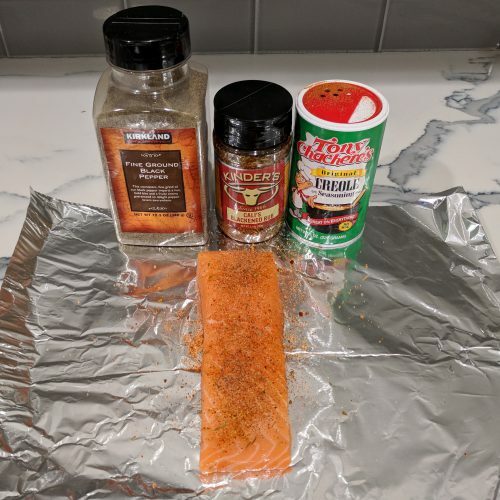 place salmon on foil and lightly season with blackened seasoning, black pepper and creole. Flip and season other side. 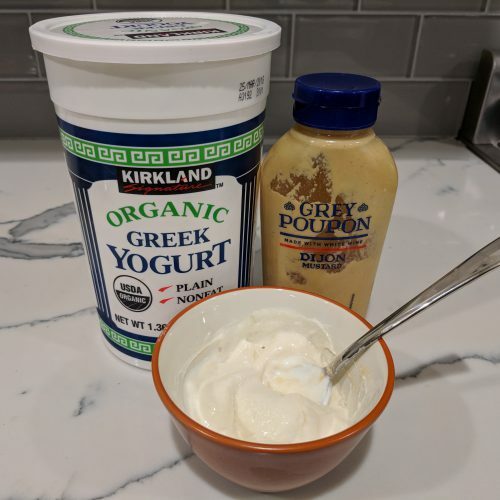 mix greek yogurt and dijon mustard in a small bowl. 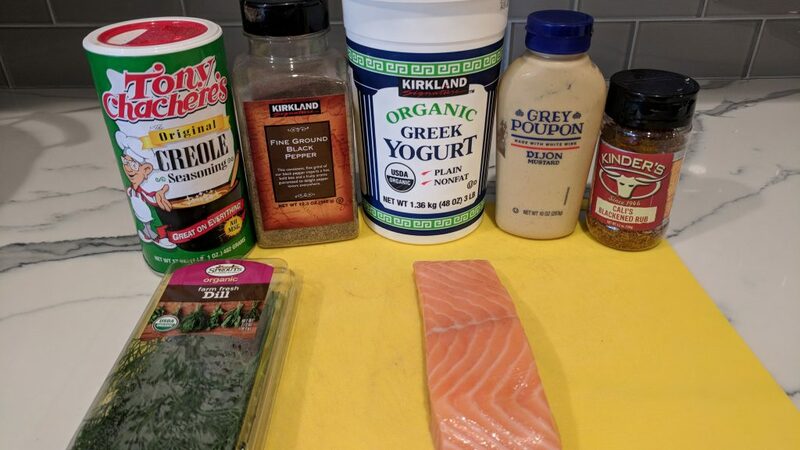 dollop greek yogurt/mustard mixture onto the top of the salmon. (do not flip!) add fresh dill to the top of the yogurt mixutre. and seal up the foil pack by closing the sides and making a tent so that the yogurt doesn't touch the top of foil. 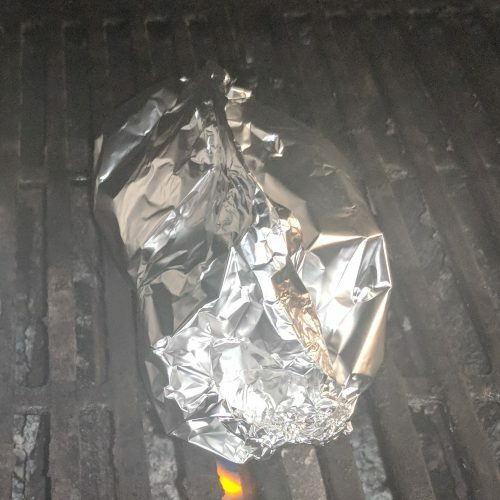 place foil pack on grill for 14 minutes. carefully remove salmon from foil and serve with cauliflower rice, cauliflower hash, quinoa, tomato/cucumber salad or your side of choice! I love that I made your blog ? ?